Rating: 7.6/10. From 52 votes. In April 2007, I attended a motor competition in Tucson, Ariz. I saw several motor officers carrying what I thought were folding knives tucked in their motor boots. Upon closer inspection, I realized they were actually carrying ultra-slim .380 ACP semi-auto pistols, which were held in place inside their boots by a metal clip. It was the Kel-Tec P-3AT pistol. As an avid gun collector, I had to add this handgun to my arsenal and promptly ordered one when I got back home. After receiving the gun, I first attached the accessory belt clip that some officers use to secure the gun inside a motor boot. I then headed to the indoor range to practice with my new gun. After firing approximately 200 rounds of a variety of .380 ACP ammunition (including both jacketed hollow-point and full-metal jacket in both 90 grains and 95 grains) without a single malfunction, I gained confidence in the gun’s reliability and accuracy. The P-3AT is remarkably small, especially when you consider it has a magazine capacity of six rounds. Its unloaded weight is a mere 8.3 oz. It’s 5.2″ in length, 3.5″ in height and only .7″ in width. This unbelievably thin design allows for deep, comfortable concealment in the waistband, leg holster, vest holster or in almost any jacket or pants pocket. The weapon functions as a DAO (double-action only) and has a hammer block that holds the hammer away from the firing pin, which provides an internal mechanical safety. The hammer block can only be disengaged by deliberately pulling the trigger. It’s impossible for a direct blow to the hammer (e.g., the dropped weapon landing on its hammer) to discharge this gun due to its enclosed slide and grip. Although crude by comparison to most other designs, the fixed sights machined into the slide assembly were functional. By virtue of its diminutive size, combat accuracy (rather than match-grade accuracy) is what this self-defense pistol is designed for. The nicely checkered grip assembly, with serrations in the front and back straps, allow for a solid grip. Recoil is definitely commensurate with the short barrel and lightweight design, but it’s certainly manageable. Those with small hands will only be able to place their middle and ring fingers around the front strap; those with exceptionally large hands may only be able to wrap their middle finger around the front strap below the trigger guard. Shooting with gloves is almost impossible because there isn’t enough room inside the trigger guard. Unlike the .32 ACP version (P32), the P-3AT doesn’t have a slide-release/hold-open lever. This means that the slide won’t lock to the rear when the last round is fired.The reality: This isn’t the type of weapon that one would necessarily speed reload. The greater disadvantage, in my opinion, is that the slide must be held to the rear by hand to inspect the chamber for a live round. This aspect is somewhat negated by the “visible chamber loaded indicator” required by many states to sell semiauto handguns. This is a very small gap between the breech face in the slide and the rear portion of the barrel chamber that presumably allows the shooter to see the rim portion of the shell casing if there’s a round in the chamber. Another minor shortcoming of the pistol is the greater degree of difficulty in the disassembly and reassembly of this weapon compared to most others. Although it’s not too tedious, some less-motivated individuals may not be willing to clean and lube the gun on a regular basis. Because the pistol is designed for everyday concealed carry, attention to regular maintenance, such as wiping down the innards with a q-tip and applying a small amount of lubricant bi-weekly, is mandatory for continued reliability. Based on my experience with this gun, I would give it an exceptional rating as a safe, reliable, accurate and highly concealable piece. Chris Boyd is a 22- year veteran of the Carlsbad (Calif.) Police Dept. He has worked patrol, K-9 and vice/narcotics. Boyd is a certified Taser, MP5, NFDD and firearms instructor, and is currently assigned as a patrol sergeant. He’s also an entry-team leader on his department’s SWAT team. This entry was posted in .380 ACP, $251-$500, Kel-Tec, Semiauto, Subcompact and tagged Handgun Reviews on August 16, 2010 by Chris Boyd. I own the P-3at, and purchased after owning the p-32 for many years. Yes, its crude, but I dont carry a firearm that has to win a fashion show. Accuracy is excellent at 7yrds, and lets face it, 90%+ of defensive shootings occur within this range. The addition of the pocketclip, and the magazine finger extension are a nice touch. This is a great defensive weapon you can carry anywhere virtually wearing anything, and do so comfortably. Highly recommended! I’m a proud P3AT owner and it worked great out of the box. Tested it with Hornady Critical Defense, CorBon, Armscor and Winchester FMJ… Was pleasantly surprised that all of this went OK. Its not as pretty or fun to shoot like my hi-cap 1911, but this goes with me wherever I go. I’m almost tempted to get a laser, but in all honesty I believe this can suit you fine w/o adding anything. I bought my P3AT several years ago, and I have to say that I’m pretty much disappointed in it. In every shooting session, it fails to feed properly, and I have to slam the slide forward with my left hand to chamber the round. Also have had several FTE’s and stovepiping. Ammunition type doesn’t seem to make any difference; won’t feed FMJ round nose or truncated cone. I have polished the feed ramp until it has an almost mirror finish; hopefully this will make a difference. Also, the trigger fails to reset on occasion, and I have to work the slide to get it to reset properly. Unfortunately, I lost the receipt, so I can’t get it worked on by KelTec under their lifetime warranty. 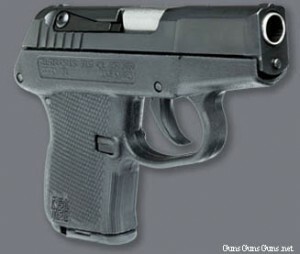 I’m seriously thinking about trading it in on a Beretta Nano; I’ve read some really great things about this little 9mm. Very functional up close and personal handgun, I put a CTC laser sight on it and the bullet impacts on the red dot ..I did not like the almost non existent sights that came on the weapon. That’s the only thing I didn’t like, a lot of new defensive ammunition in .380 being offered and it performs well with all of the marque name ammo. I wear it with a DeSantis quick snap holster and don’t even know it’s there, the Crimson trace laser came with a pocket holster that I need to try out.. All in all its my EDC and I need to have 100% confidence in the pistol if I’m going to use it to defend my life and I do!! I purchased a P-3AT in 2010 as a light carry, very concealable weapon. After a feed ramp cleanup and some other burr removal I have a reliable little shooter with an outstanding warranty for few the bucks spent. Crimson Trace laser helps out greatly with the so-so sights and after 100’s of rounds through the barrel it seems to get better and better. No P32 category… so… I carry my P32 in my front pocket almost everywhere, even in cool weather when I also carry my Kahr Black Diamond P40… the P32 is a GREAT little pistol, plenty accurate up close. Mine has been flawless… I HAVE heard of some reliability issues with the P-3AT, but not many. I load Magsafe ammo (impressive in a small caliber!) for the first 2-3 rounds, then Fiocchi Extrema with XTP’s. P3AT is a little work horse. Keep it clean and oiled ( especially the rails) . Keep it in a pocket holster. I prefer to use “Mag-Safe” ammo. Look it up, it out performed 357 in tests. I have carried mine for over 10 years and like it. While living in Florida, many police used this as a backup. Probably because they are made on Coco Florida. No bells and whistles but the price reflects that. My new P3AT is back at the factory with several issues. My first 3 times out the slide jammed shut after only a few rounds.Next two times at the range it failed to eject reliably and the disassembly pin “walked out” after only a few rounds. The trigger is not finished smoothly and needed some shrink tubing to make it comfortable to shoot. The factory says it will be about 6 weeks before they can get to it. Totally unacceptable. Even the inexpensive Hi Point has a better guarantee. If it comes back as unreliable as before it will be the last Kel Tec firearm I purchase.